So many endemic birds – either stunningly beautiful or with fascinating and evocative vocalizations – made our tour of the Atlantic rainforests of Brazil’s Rio de Janeiro and São Paulo states memorable and fun. Ridiculously colorful tanagers and sparkling hummingbirds vied for our attention, skulking antbirds and gnateaters teased us, and feeders made for some easy birding. The sounds of several Bare-throated Bellbirds echoing across the hillsides with Hooded Berryeater and White-browed Warbler ringing through the forest provided for a sensation that isn’t repeated anywhere else in South America. We tallied an impressive 350 species of birds seen and another 20 heard, as well as many interesting plants, insects, reptiles, and other critters. Such a big list means we also worked on teasing out the many obscure tyrannulets, and SE Brazil is full of them. A Pavonine Cuckoo at arm’s length on our next-to-last day was voted tour favorite, fantastic to watch it utter its soft song of six whistled notes. Other species getting top votes included a pair of giant Robust Woodpeckers, an exciting flock of Scarlet Ibises, very attractive Bay-chested Warbling-Finches, and a ridiculously cooperative Red-and-white Crake. At our first birding area north of Rio de Janeiro we snagged the very local Three-toed Jacamar and Gray-winged Cotinga with a great deal of luck, despite fog and a sudden shower. The weather was unusually cool, so insect activity was rather subdued, but we did marvel at the beauty of this cicada, Carineta diardi. At our birding stop at REGUA, a Chestnut-backed Antshrike pair was feeding a recent fledgling at the close-focus limit of our binoculars. A day and a half of rain at Itatiaia National Park “forced” us to spend more time watching the feeders on the hotel balcony where Green-headed Tanager showed off its colors. Red-breasted Toucan also appeared a few times to sample the fruit put out by the restaurant workers. The coastal lowlands and foothills of São Paulo were very productive, with antbirds, gnateaters, and many hummingbirds. 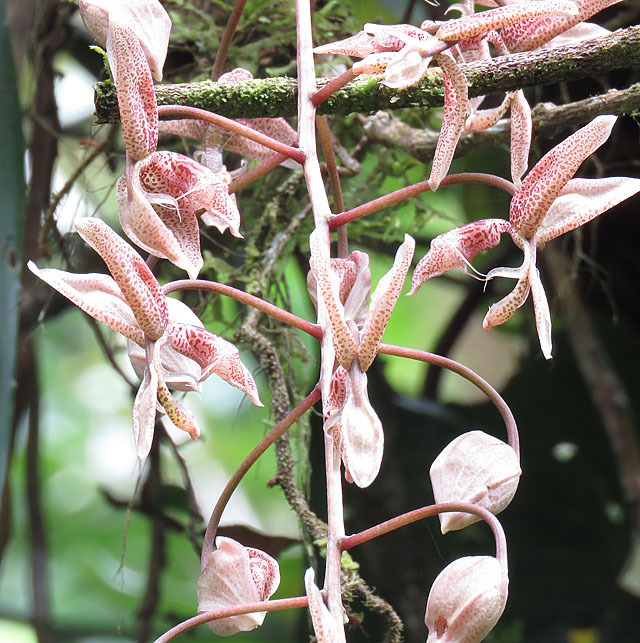 On one birdy morning walk we took advantage of a break in the bird activity to admire this gorgeous orchid, Gongora bufonia. We finished the tour at the amazing Intervales State Park, and our local guide Renato was a fantastic help with his super sharp ear and local knowledge of recent sightings. This Common Potoo was on a roost it had been using for a few days. We visited a double lek of Dusky-throated Hermits and Purple-crowned Plovercrests (below), both of which cooperated nicely for us. A feeding station hidden on a narrow forest trail hosted an acclimated family of the rarely seen Spot-winged Wood-Quail, and we had superb looks at these elusive birds.